Posted February 18, 2016 by Nanette & filed under Chris's Corner. Question: Chris, we are working on a project and the specification states “Installers must be certified and be able to present a valid, unexpired Installer Certification card.” How do I obtain this card and why does it expire? Answer: The requirement for installer certification is something we are seeing in the marketplace, more and more. A critical component of a PVC coated conduit system is proper installation. Hence, since most failures are due to improper installation, proper installation is essential for ensuring the best possible service life for a conduit system. Installer certification is based upon training that includes classroom instruction, hands-on instruction, and an exam. 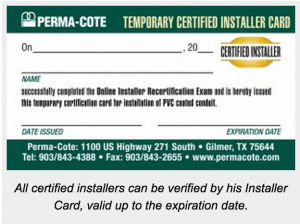 After the training has concluded, those who have passed the installer certification exam are issued an official certified installer card that is good for two years from the date of issue. The expiration date ensures that those installing PVC coated conduit have been informed or reminded of the latest installation techniques and tools. Installer Certification is free of charge and is available at the job site, contractor’s office, or the manufacturing facility. Question: My installer certification card has expired. What are the steps for renewing it? Answer: Renewing your installation card is simple and can be done in person or online. Only those who have previously attended training and received an initial installer certification card are eligible for online renewal. The process takes about 15 minutes. You will review the proper installation techniques and tools and watch a video covering proper installation. Once you have reviewed the material you will then take the installer certification renewal exam. Upon passing the exam, a temporary card is issued for two weeks usage. Within two weeks, Perma-Cote PVC-Coated Conduit will mail out a permanent card to the address you provided.